Anyone who has seen the movie "Beetlejuice" will recognize me as The Receptionist from the offices of The Recently Deceased. 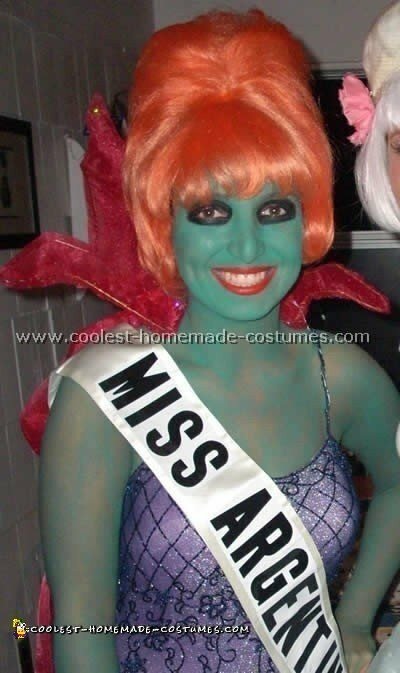 She was a deceased Miss Argentina. My boyfriend wanted to be the Beetlejuice character for Halloween so I decided to dress as her since we always joked that she and Beetlejuice would have made a good couple. As far as I know there is no specific Beetlejuice costume available from a store for this character. When I went on the internet to get ideas how to make it I only found queries from other people who wanted to be this character! In the end I found some good quality still pictures of her from the movie. I watched the movie again and went from there. I purchased a reddish orange beehive hairdo wig from an online wig store. I also purchased green body paint online and purchased black body paint (for my eye area) at a local party store. The bright orange lipstick just happened to be available at a nearby beauty supply store and should be easy to find. For the sash I used the sash I was awarded in a local beauty contest, covered the lettering with a matching satin fabric (about a yard) and repinned the sash so that area was across my back. Then I purchased self-sticking boat lettering from the hardware store and applied it to the other side of the sash. If you don’t have a sash you can buy a blank one from a trophy/award store. The hardest thing to make on this Beetlejuice costume was the cape. I had to make a stand-up collar that looked like flames. You can do it one of two ways: either use medium-gage wire that’s flexible enough to shape but will still stand up; or you can take a lightweight wire hanger and bend it to the shape. I used a hanger. I bought two yards of sparkly pink fabric and cut it in half. I then halved one half again and lightly glued each half over the wire shape. Then I trimmed it to the hanger shape. Then I stitched around the wire shape with bright pink thread. I then took the other half of the fabric, rolled one end about an inch and stapled it to the bottom of the wire shape. I put the wire shape across my neck and used thin wire to attach it to the straps of my gown. The remaining fabric just flowed down my back. Oh and the gown? It was my gown from my Homecoming dance in high school! But you can get a gown from a thrift shop too. It should be purple or red print. I wore black high-heeled pumps on my feet and drew stitches on my wrists (because the receptionist said she died after an "accident" and shows her wrists in the movie.) And that’s how I made my costume!